The research presented in this paper explores the contribution of avatar fidelity to social interaction in virtual environments and how sensory fusion can improve these interactions. Specifically, we vary levels of interaction fidelity to investigate how responsiveness and behavioural realism affect people’s experience of interacting with virtual humans. This is accomplished through the creation of Cinemacraft, a technology-mediated immersive platform for collaborative human–computer interaction. Cinemacraft leverages a voxel game engine similar to Minecraft to facilitate collaborative interaction in a virtual 3D world and incorporates sensory fusion to improve the fidelity of real-time collaboration. The primary hypothesis of the study is that embodied interactions result in a higher degree of presence, and that sensory fusion can improve the quality of presence and co-presence. We tested our hypothesis through a user-study of 24 participants. Based on suggestions from existing literature, we sidestep the uncanny valley effect through the use of low fidelity avatars (a la Minecraft) and identify cues that impact users ratings of presence, co-presence and successful collaboration. The findings and ensuing data in this research can be applied to produce a more compelling platform for live collaborative interactions, performances, and empathetic storytelling. This research contributes to the field of immersive, collaborative interaction by making transparent the platform, methodology, instruments and code accessible for team members with less technological expertise, as well as developers aspiring to use interactive 3D media to promote further experimentation and conceptual discussions. All 24 participants recorded their responses to each experimental interaction exercise using a presence questionnaire based on Slater’s (Slater 1999) presence questionnaire, a co-presence questionnaire based on the Networked Minds (Biocca and Harms 2001) and Nowak’s (Nowak and Biocca 2003) co-presence questionnaires and finally, the immersive tendencies questionnaire (Witmer and Singer 1998). Please rate your sense of being in the virtual environment, on a scale of 1 to 7, where 7 represents your normal experience of being in a place. How much were you able to control events? How responsive was the environment to actions that you initiated (or performed)? How natural did your interactions with the environment seem? How completely were all of your senses engaged? How much did the visual aspects of the environment involve you? How much did the auditory aspects of the environment involve you? How natural was the mechanism which controlled movement through the environment? How aware were you of events occurring in the real world around you? How aware were you of your display and control devices? How compelling was your sense of objects moving through space? How inconsistent or disconnected was the information coming from your various senses? How much did your experiences in the virtual environment seem consistent with your real-world experiences ? Were you able to anticipate what would happen next in response to the actions that you performed ? How completely were you able to actively survey or search the environment using vision? How well could you identify sounds? How well could you localize sounds? How compelling was your sense of moving around inside the virtual environment? How closely were you able to examine objects? How well could you examine objects from multiple viewpoints? How well could you move or manipulate objects in the virtual environment? To what degree did you feel confused or disoriented at the beginning of breaks or at the end of the experimental session? How involved were you in the virtual environment experience? How distracting was the control mechanism? How much delay did you experience between your actions and expected outcomes? How quickly did you adjust to the virtual environment experience? How proficient in moving and interacting with the virtual environment did you feel at the end of the experience? How much did the visual display quality interfere or distract you from performing assigned interaction exercises or required activities? How much did the control devices interfere with the performance of assigned interaction exercises or with other activities? How well could you concentrate on the assigned interaction exercises or required activities rather than on the mechanisms used to perform those interaction exercises or activities? Did you learn new techniques that enabled you to improve your performance? Were you involved in the experimental interaction exercise to the extent that you lost track of time? 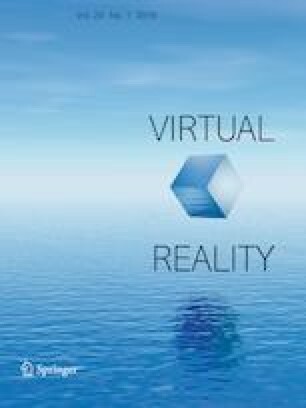 To what extent were there times during the experience when the virtual environment was the reality for you? When you think back to the experience, do you think of the virtual environment more as images that you saw or more as somewhere that you visited? I often felt as if I was all alone. I think the other individual often felt alone. I hardly noticed another individual. The other individual didn’t notice me in the room. I was often aware of others in the environment. Others were often aware of me in the room. I think the other individual often felt alone. I often felt as if I was all alone. I sometimes pretended to pay attention to the other individual. The other individual paid close attention to me I paid close attention to the other individual. My partner was easily distracted when other things were going on around us. I was easily distracted when other things were going on around me When I was happy, the other was happy. When the other was happy, I was happy. My interaction partner seemed to find our interaction stimulating. My interaction partner communicated coldness rather than warmth. My interaction partner seemed detached during our interaction. My interaction partner was unwilling to share personal information with me. My interaction partner created a sense of closeness between us. My interaction partner was interested in talking to me. I wanted to maintain a sense of distance between us. I was interested in talking to my interaction partner I perceive that I am in the presence of another person in the room with me. I feel that the person is watching me and is aware of my presence. The thought that the person is not a real person crossed my mind often. The person appears to be sentient (conscious and alive) to me. I perceive the person as being only a computerized image, not as a real person. Participants were given the interaction exercise sheets for each experimental interaction exercise and were expected to enact out and guess the body expressions within a fixed amount of time for each experimental interaction exercise, without stating or explicitly alluding to the caption on the list. The expectation was that the number of body expressions successfully guessed and enacted from their designated lists, would increase in interaction exercises with higher interaction fidelity.